Rock and Roll Hall of Fame member Patti Smith appeared on Mountain Stage in February 2018. Patti Smith & Family- "People Have The Power," Live on Mountain Stage. 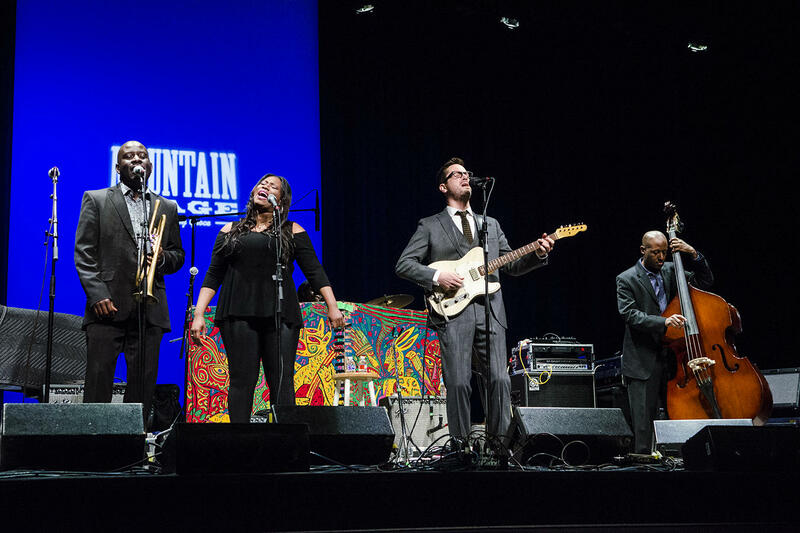 This week's episode of Mountain Stage with Larry Groce is a special edition with favorites chosen by some of our staff, band and crew. We asked members of our team here at Mountain Stage to reflect on some of their favorite performances from the past year's worth of shows, and we used their feedback to curate this week's special episode. A near universal favorite among our team was the February, 2018 appearance by Rock and Roll Hall of Fame member Patti Smith, along with her daughter Jesse, son Jackson, and legendary producer and guitarist Lenny Kaye, who were joined by Mountain Stage Band members Steve Hill on bass and Ammed Solomon on drums. With the election finally in our rear-view mirror, we thought "People Have The Power" was a fitting choice to represent this week's show as our Song of the Week. See the entire playlist, including songs by The Wood Brothers, Joan Osborne, The Mountain Goats, Ranky Tanky, Kat Edmonson and much more, and find out where you can listen on an NPR station near you. From South Carolina, Ranky Tanky left a lasting impression on our staff and crew, who chose favorites from 2018 for this week's special broadcast. Bottle Rockets- "Stovall's Grove" live on Mountain Stage. Bit Logic is the latest album from road-tested, blue-collar rockers Bottle Rockets, who have been visiting Mountain Stage since 1995. Rock & Roll Hall of Fame member Patti Smith and her family returned to West Virginia in February 2018 to accept the posthumous induction of her husband Fred "Sonic" Smith into the West Virginia Music Hall of Fame.